I’ve been trying to get back to sending out the newsletter on Wednesdays but that day keeps being very wild around here. Gray and green. The weekly rains are coming in today and we have been going like crazy to get things done before they get here. Green because the leaves are really flying out now and the grass and weeds are growing fast. The beautiful weather early this week has finally given us the ideal conditions for weeding and cultivation which has been the main goal. We have cleaned up at least three quarters of an acre in both the flowers and the vegetables, just in the nick of time as some of the lettuces were beginning to succumb the chickweed. 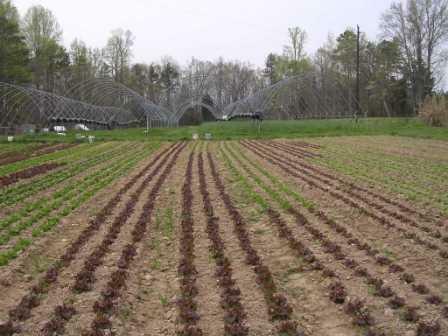 When repeatedly surveyed by researchers, organic farmers always rank weed control as the number one problem that they deal with and would like to have some “miracle” research come up with easy ways to overcome these pests. I am not holding out for a miracle, just the hope of a few dry days at the right time so we can do some timely cultivation, that with a few cultural tricks thrown in will keep the weeds at bay. Of course we are thankful for the young backs that work for us and do most of this weeding! Some things have not changed much in agriculture over the centuries, my brother has a book on market gardening from the 1800’s and we always got a chuckle when they would repeatedly refer to some tedious task as “usually being done by young boys”. We did get the new asparagus planted, finishing just as the rains started, now we wait to see the new ferns coming up. The earliest tomatoes were planted into the sliding tunnels and look to be taking off well. We are running about a week behind last year on all of the tomatoes, we can’t make them grow any faster in the greenhouse than they are want to. The big planting (20 varieties) were moved up from the small cells to the 4 inch pots and are due to go out to the field in 10 days but again I feel that they may be a few days late. Our goal is to have the plants growing vigorously in the pots and then plant them at the right time so they just continue that strong growth. If we put them out too young they can get shocked and delay their growth and if we wait too long they will become too large for the pots and stop their growth and set the first harvest back as well. The other problem that we are having this year in both the tomatoes and the peppers is erratic seed germination in some varieties. We had to re seed some things which is going to put those varieties several weeks behind the others, this is a first for us as we have never had to completely restart a variety. Oh well always a new twist out here on the farm!